This homage to masochism heads up and down 5 of the steepest streets in the Berkeley Hills (steepest grade, over 25%). It's actually not all that bad if you pace yourself, but this ride will punish you if you try to attack it. From just about any point on the ride you can coast downhill to a BART station. There's also a "Mild Discomfort" ride which covers most of the same ground, without attacking the really steep hills. Marin is simply ridiculous; one advantage of doing it first is that all the rest of the hills will look easy by comparison. The main disadvantage is that it could kill you before you get a chance at any of the other hills. 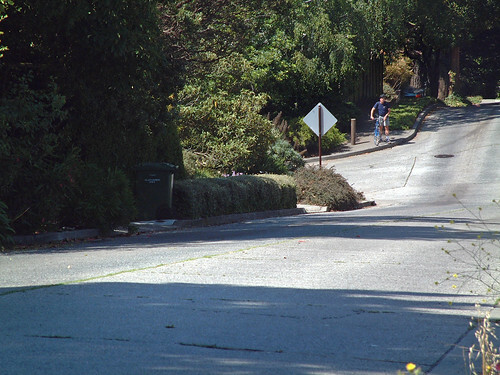 It crosses a number of quiet streets, which you can use as an opportunity to rest/cheat without getting off the bike; just turn down the side street and coast for a while as your heart rate comes back under your anaerobic threshold. The first block is rather steep, perhaps a 14% grade. After that it eases up for 3 blocks, hanging at around 10% until the block before Spruce. That block is again above 15%, and it looks a little like it might be the road's peak--it's so steep you can't see the road above it. Of course, it's not the peak. Crossing Spruce gives you a little break (remember to take advantage of CVC 57492.1: "the right-of-way must be yielded to people in extreme pain"), and then the next couple blocks again aren't quite so bad. Then the block before Euclid is pretty nasty, pushing 20% grade, but really it's just letting you know that you're about to begin the hard part. Past Euclid is where the road gets really absurd. The average grade from Euclid to Grizzly Peak is 22%, but that includes the flat intersections. Actual riding is closer to 25%, and that first block is probably near 30%. I don't care how low your gears are, or how light your bike is; either you have the leg strength and aerobic capacity to ride up this hill, or you don't. Good friggin' luck. The first block, as mentioned, is the steepest. The second block is a little less steep but still ridiculous. The final block is about the same as the second, but it's also much longer than the other two. I always feel tempted, if I have anything left in my legs, to power up the last few meters just to get the damn thing over with; I recommend against doing that, because we have a lot more climbing to do today. South Park is the fastest descent in the East Bay (with the possible exception of Moeser for those with death wishes); the top part has curves but isn't twisty enough to slow you down, and then you can blast out of the last turn into the steepest part of the descent, a straightaway near a parking lot. I hit 88.5kph once (my fastest recorded speed anywhere). Today, though, we are going up it. South Park is actually probably the easiest of the five climbs. It starts out fairly easily, then gets rather steep around the end of the straightaway. It continues steeply basically until the top of the hill, but with only 200 meters total climb, and grades which will look easy after Marin, it shouldn't be that difficult. 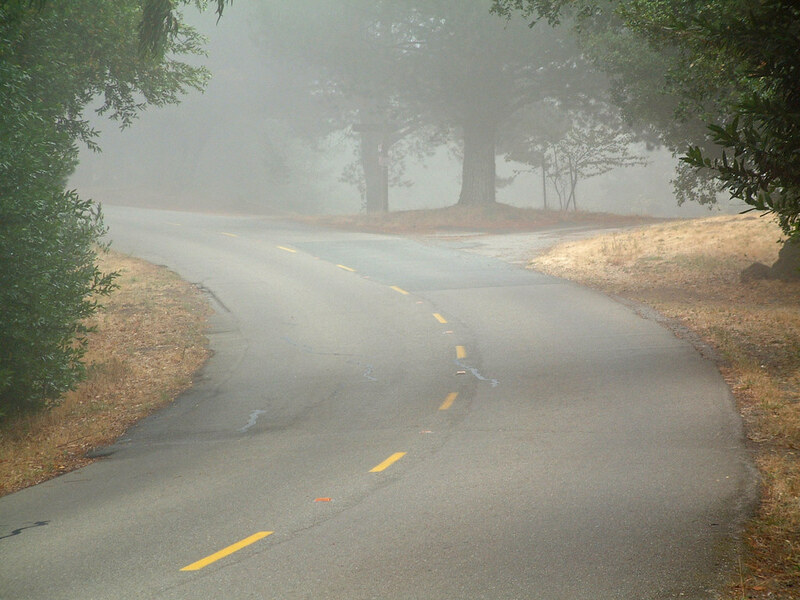 Centennial is the road most frequently used by strong cyclists to get out of Berkeley. 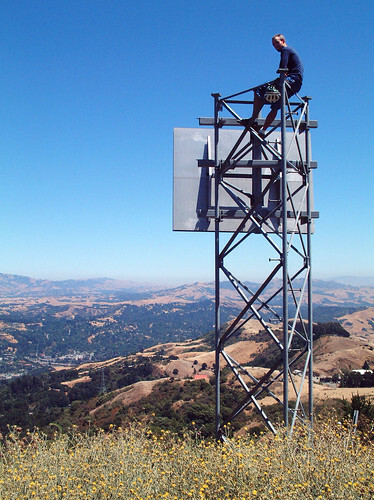 It starts fairly gently, then starts to climb steeply near the Botanical Garden and past LBNL. 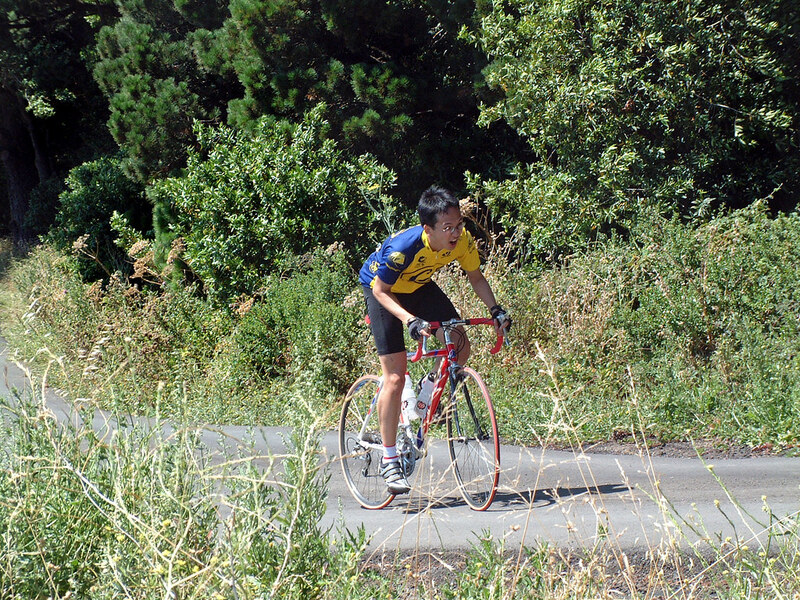 It's a fairly constant 11% grade from the LBL gate to the rest point at Lawrence Hall of Science. There, it flattens out for a while, and then climbs a little more, less steeply, to reach Grizzly Peak. El Toyonal is a pretty rough climb, about as steep and long as the hard part of Centennial. But then the hard part starts. You can continue on El Toyonal and go over a partially washed-out bridge and hook up with Wildcat Canyon, but we're turning left and going up Lomas Cantadas, which is the hardest climb to Grizzly Peak from the east. It has about three switchbacks where you're already working pretty hard, and you see the hill getting steeper into the switchback, but then instead of easing off it actually gets steeper on the next straightaway. The straight climb towards the stables is the hardest part; once you make the right turn past the stables towards the llama pen, you have pretty much made it. Claremont is the least steep of all the hills we're climbing today, but it's harder than Centennial or South Park because it's longer. 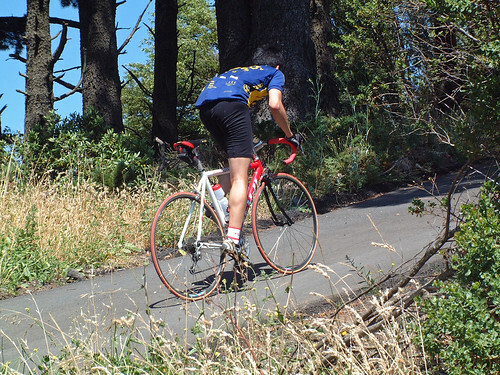 Unlike most of today's climbs, it comes at you in waves; there are sections which are well above 10%, particularly the first of two switchbacks near the top. There are pitches which are less steep, but really nowhere you can get a rest until after the last switchback. Go past the Steam Trains parking lot, and keep bearing right. A paved path goes through a gate and up the hill. You'll have to dismount to get around the gate. The footpath climbs fairly steeply for a while, then flattens out. Keep bearing to the left; at one point there's a fire trail to the right and a paved path to the left, stay to the left again. After the fork, there's another switchback and then the final climb begins. It's not very long, but it's extremely steep (in two pitches) and often covered with pine needles or gravel. After you're past the second steep pitch, it's only a short ride to the very top of the hill (Vollmer Peak). Congratulations! 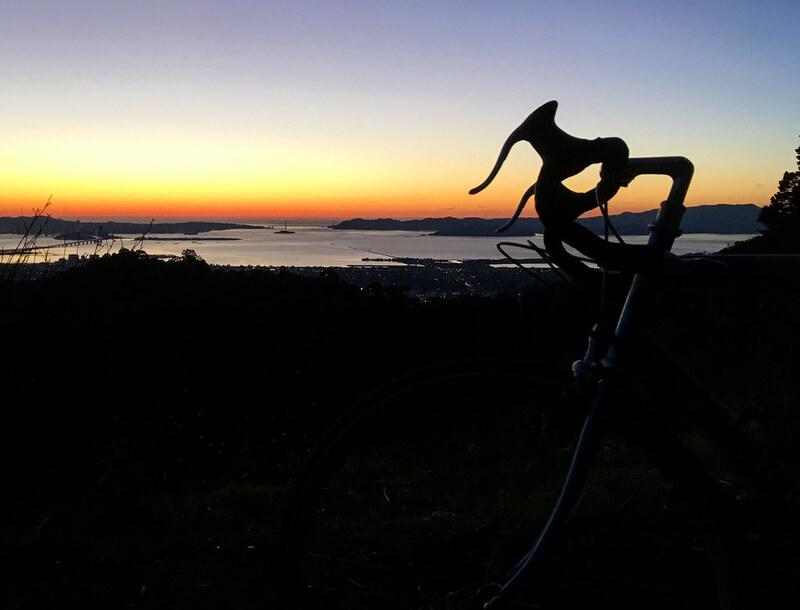 From there, you can coast downhill to your favorite BART station. All content copyright © 2019, Tom Holub. All rights reserved.